The table does not lie. Rangers' debut and, they hope, only season in the Scottish Third Division shows they are third after seven matches, with a trio of wins and draws and a single defeat. They trail joint-leaders Queen's Park and Peterhead by a point. The overall facts and figures ought to be unremarkable, but for those following Rangers' journey in Scottish professional football's lowest tier, further analysis generates heated debate. Three out of three wins at home pleases the club's fans, but nine points have been shelled from a possible 12 on their travels. was a dispiriting result for the club. The performance at Forthbank sapped, probably temporarily, the enthusiasm of the Rangers supporters for visiting Scotland's football outposts. Howls of anguish cascaded around the little ground from fans who have hitherto been bursting with defiance and pride. Losing to the team propping up the Third Division was a sickener and has cast doubt on their previously unwavering loyalty to manager Ally McCoist. It followed draws at Peterhead, Berwick and Annan and a fraught . On that occasion, Rangers were relieved to exit Mosset Park with a 1-0 win. To further contrast the home and away form, Rangers recently enjoyed a 2-0 Ibrox victory over then Premier League leaders Motherwell in the Scottish Communities League Cup. Derek Ferguson, now a football pundit with BBC Scotland, believes there is a straightforward diagnosis for Rangers' travel sickness. "It's quite simple - it's about attitude," said Ferguson, whose Rangers career ran from 1983-1990. "It's incredible to think we are well into October and Rangers still can't win away from home. "Players can start to make a meal of things - the dressing-room isn't up to what they are used to, the crowds are not as big - but you've got to have the right attitiude. "When you step off that team bus, you've got to switch on, you've got to have the right mentality. The mentality at Rangers is lacking and it's a big problem for them." Ferguson also doubts the wisdom of signing players such as Emilson Cribari, Anestis Argyriou and Sebastien Faure to steer the club back to the SPL. "I was amazed that Ally brought in a Brazilian, a Greek and a French guy," said the former Rangers midfielder and ex-manager of Clydebank and Stranraer. "I would have looked at bringing in good First Division players who had sampled life in the Second and Third Division. "You've got to get out of that league and you've got to play a certain type of football at times. "I don't think he has brought in the right players - I'd have looked at it as a three-phase thing. "Get out of the Third Division, then the Second and, when you are in the First Division, start to add a bit of quality, some bigger names, maybe even some foreign boys. "When you get back to the SPL, which you assume they are going to do, then bring in the French guys and the Brazilians. "I think he would have been better going with Scottish players who know what it is all about. "You've got to roll the sleeves up. You've got to win your battle, whether physically or in a football sense. It doesn't look as if the Rangers players are doing that. "If they are shell-shocked at the moment, going to places like Elgin in January is going to be a culture shock. When the weather isn't the best, you don't want to be rolling the ball along the 18-yard box." Ferguson believes McCoist, a friend from their Ibrox playing days, has looked too far ahead, even with the imposition of the transfer ban that was one of the penalties imposed on the club. Rangers are six weeks into a year-long transfer embargo, their punishment for bringing the game into disrepute under the calamitous stewardship of Craig Whyte. Goalkeeper Neil Alexander and the versatile veteran Lee McCulloch represent the old guard. They witnessed the departure of more than 20 members of the first-team squad, the promotion of a clutch of others from the reserves and the arrival of new recruits from Scotland and abroad. 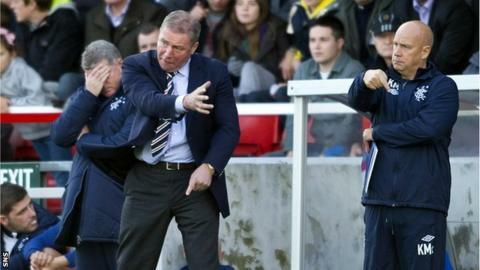 McCoist cannot throw money at the problem of his team's away form; he has to manage it, through tactics and motivation. But for Ferguson, the squad must do much more to avoid further embarrassing results. "Ally is a great guy," he said. "I am desperate to see him do well, but it's down to the players. "They have to give themselves a shake and go out and start playing for the manager and the backroom staff." Read more on Rangers: Charles Green SFA disrepute charge "not proven"